DTNA Outlines Goal to Dominate the Electric Vehicle Market | Sonny Merryman Inc.
Roger Nielsen, president and CEO of Daimler Trucks North America, discusses the development of battery-powered Freightliner trucks during a press roundtable at the American Trucking Associations’ 2018 Management Conference & Exhibition in Austin, Texas. Customer interest in electric commercial vehicles is happening quicker than expected, but Roger Nielsen, president and CEO of Daimler Trucks North America, said DTNA will continue its efforts to dominate the electric commercial vehicle space in North America. “In 2020 we’ll have the highest number of [electric] vehicles on the road in trucking segment,” said Nielsen during a press roundtable at the American Trucking Associations’ 2018 Management Conference & Exhibition in Austin, Texas. “We are trying to get the most experience as quick as we can,” adding that the OEM that can provide a durable, reliable vehicle with batteries that have the right power-to-weight ratio will be the company that finds that finds the best value solutions for its customers. “It’s no different than diesel power, it’s all about energy consumption,” he said. “The [OEM] that wins the energy consumption race will win the [electric vehicle] race as well. 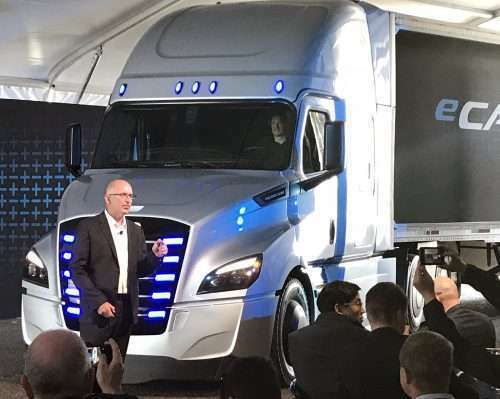 Nielsen said Freightliner customers already are looking for answers as to what technology they should invest in as some municipalities across the country signal their intent to limit commercial transportation to near-zero or zero-emissions vehicle solutions. DTNA unveiled its Freightliner eM2 medium-duty and eCascadia heavy-duty trucks at an investor event in June, and earlier this month hosted an Electric Vehicle Council meeting with 30 fleets to garner reaction and input directly from its customers. “Our customers were pleased that we could take a Cascadia vehicle they were familiar with and make a smooth transition from diesel-powered truck to an electric-powered truck,” said Nielsen. Initial use cases for Freightliner electric vehicles will revolve around port drayage, regional and inter-city applications, but the ultimate goal is a long-haul electric vehicle solution. 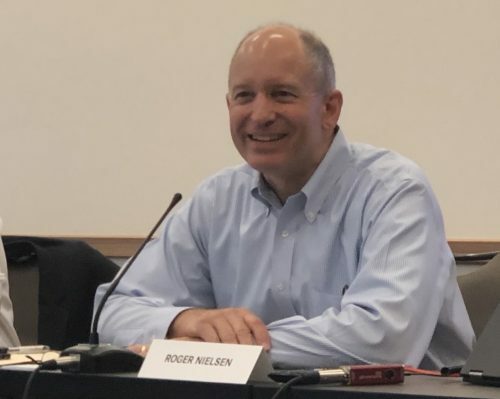 Nielsen said NFI and Penske Truck Leasing next month will take possession of its Electric Innovation Fleet, a customer trial of 30 eCascadia and eM2 power units. DTNA will collect feedback on issues including charging infrastructure, incentives, route planning, servicing and use cases. DTNA unveiled the eCascadia and eM2 battery-powered concept vehicles at an investor summit in June. In the medium-duty electric vehicle segment, the Freightliner eM2 initially will have two battery-powered powertrains by two different systems integrators. “The industry exploration is all in our quest to find a battery-connected vehicle solution that provide the best solution and positive use case for our customers,” said Nielsen. Nielsen said a switch from diesel to battery-electric vehicles doesn’t mean customers should have to adjust current trade cycle practices. “They are realizing that just like with diesel exhaust emissions, they should expect an improvement in energy consumption every year,” he said. Residual value through the vehicle’s life and resale value remain unknowns but are at the top of the list of customer demands. Story originally published by CCJDigital.com.